According to an article in the Canadian Conservation Newsletter, the designs were painted by a friend of Lennon's known as "Gypsy Dave". 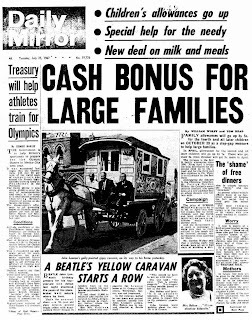 Cynthia Lennon's memoir claims that the work was carried out by "a firm of barge and caravan designers". An article about the car on the Ottawa Beatles site states that the work was carried out by J.P. Fallon Limited, a coachworks company located in Chertsey, Surrey. The site has a newspaper article confirming this. J.P. Fallon commissioned Steve Weaver's pattern of scroll and flowers (who came up with design) for the Phantom V. The idea to make the car psychedelic was based on a suggestion from Marijke Koger, a member of the Fool who told Lennon to "paint the Rolls like the gypsy wagon" that was in his garden.